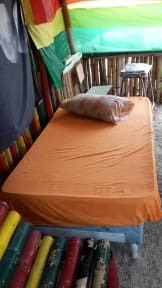 If you stay in Moonrise Hostel you will get a taste of raw Jamaica. You will see locals hanging in and around the hostel during the day. 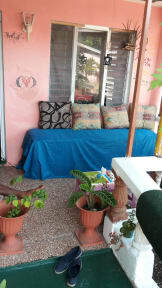 On the front porch of the hostel you can chill out and enjoy the good Jamaican vibrations. The locals are always in for a party and will join you without a hassle. There is free Wi-Fi available in and around the hostel. We are located in one of the best areas of the city, near to some of the finest landmarks and tourist attractions of the city such as Folly Ruins, Titchfield Cannons, Navy Island and Folly Lighthouse, amongst other interesting places that you can visit around our city. We have one dorm for eight people, fully equipped to bring the maximum level of comfort to our guests and travellers. A shared kitchen and a super cosy veranda are waiting for you to bring more vibes to the place! The hostel is still young, which is why we always try to improve the level of comfort! If you'd like to help us, do not hesitate. The wall can be decorated with your paintings and drawings, the garden can always use an extra flower to be planted. Feel free to relax your mind and be part of the lodging.